Clicks (All) in Facebook is the total number of clicks on your ad. This may include clicks to your website, page likes, post comments, event responses, or app installs. Clicks in AdStage is the number of clicks on links appearing on your ad or page that direct people off Facebook as a result of your ad. 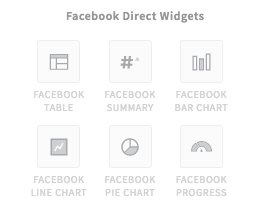 If you want to create a report on AdStage that looks at Clicks (All), you can do so by using any Facebook Direct Widget. Have questions? Feel free to reach out to us at support@adstage.io.